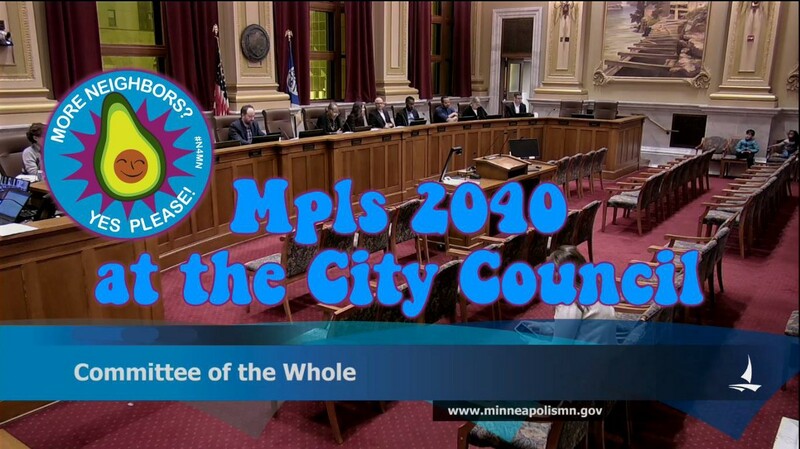 Last week, a big group of you came out to City Hall to support the Minneapolis 2040 Comprehensive Plan. We were thrilled that the Commissioners voted 8–1 to send the plan to the City Council. Now, the City Council will be reviewing the plan — this is a critical time to make sure they hear support from residents of their wards. We want to ensure the plan is successfully passed, and isn’t watered down any further to appease a small set of negative voices. If you want to help but feel like you don’t know what to say, don’t worry: talking points are included below. 2 Send a short email in support, by Sunday, November 11. Even 2–3 sentences will do. Send your email to the Council member for your ward, and then ‘cc the rest of the council members. Their emails are listed below. Not sure what to say? See our talking points below. 3 Submit a formal comment on the Minneapolis 2040 plan document. Visit minneapolis2040.com to do so. Note that only one comment per person can be submitted. I support the Minneapolis 2040 Comprehensive Plan, specifically its goals to increase housing affordability and reduce economic disparities. I support policy 1, Access to Housing, which will increase supply and variety of housing in Minneapolis. I believe we should welcome multifamily housing in every neighborhood, and higher concentrations of homes along transit routes. Minneapolis and the broader region is facing a housing shortage. Building more housing is one critical part of a long-term solution for housing affordability in the region. Increasing supply will help stabilize rapidly rising rents. Cities like Pittsburgh and Seattle have seen this exact effect. Minneapolis cannot meet its climate goals by solely accommodating for car-dependent lifestyles. Denser housing, neighborhood commercial corridors, and access to transit reduce car trips and create opportunities for those who cannot afford a car or choose to live without one. Minneapolis 2040 is a progressive step toward reducing the pressure of gentrification. Lack of new housing in desirable areas pushes development & its impacts into gentrifying areas. We can reduce this pressure by allowing more housing to be built everywhere. The Minneapolis 2040 plan takes small steps to right historical wrongs.Minneapolis has a long history of redlining and racial segregation, and allowing more housing in areas that have been historically racially segregated reduces the impact of those past barriers. Allowing more homes is a senior-friendly policy. By allowing more senior housing, where residents do not have to worry about maintenance like lawn mowing, sidewalk shoveling, and the other upkeep, we can allow more seniors to age in their current neighborhoods. Minneapolis drastically limited new apartments in the 1970’s, so we have very few homes that are aging, and therefore, “naturally occuring affordable housing.” Allowing new multi-family buildings now ensures the next generation will not have to deal with the same shortage we are in today. [If you’re comfortable discussing your own personal situation, share that, as well as why you think these policies are specifically important in your neighborhood/ward]. N4MN: What is the Comp Plan?